- Non-invasive locking technology provides easy-to-use security solution that requires no device modifications, preserving the Surface Proâ€™s hardware warranty and aesthetics. - Strong lock head meets Kensingtonâ€™s industry-leading standards for tamper-resistance, reliability and durability. 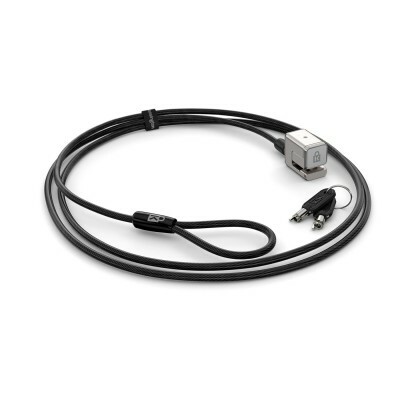 - 5mm keying system includes patented anti-pick Hidden Pin Technology, and is part of Kensingtonâ€™s robust key management solutions that include Master Keyed (K62052M) and Supervisor Keyed (K62052S) options to help IT managers minimise the number of keys required to secure devices in mixed technology environments. - Carbon steel cable resists and deters cutting attempts. - Register & Retrieve program offers free and secure cloud-based key replacement. Non-invasive locking technology provides easy-to-use security solution that requires no device modifications, preserving the Surface Proâ€™s hardware warranty and aesthetics. Tested for torque/pull, foreign implements, lock lifecycle, corrosion, key strength and other environmental conditions, this lock head meets Kensingtonâ€™s industry-leading standards for tamper resistance, reliability and durability so you can secure your Surface Pro with confidence. 5mm keying system includes patented anti-pick Hidden Pin Technology, and is part of Kensingtonâ€™s robust key management solutions that include Master Keyed (K62052M) and Single Keyed (K62052S) options to help IT managers minimise the number of keys required to secure devices in mixed technology environments. Offering the same level of cut-resistance and theft-deterrence as thicker cables, the 1.8m (6ft) plastic sheath-covered carbon steel cable offers security with greater mobility. Kensingtonâ€™s online key registration program that allows for quick, secure and easy key replacement if it ever gets lost or stolen.